His Appeal, influential 1829 pamphlet, denounced slavery. A free black, he grew up in Wilmington; moved to Boston by 1825. 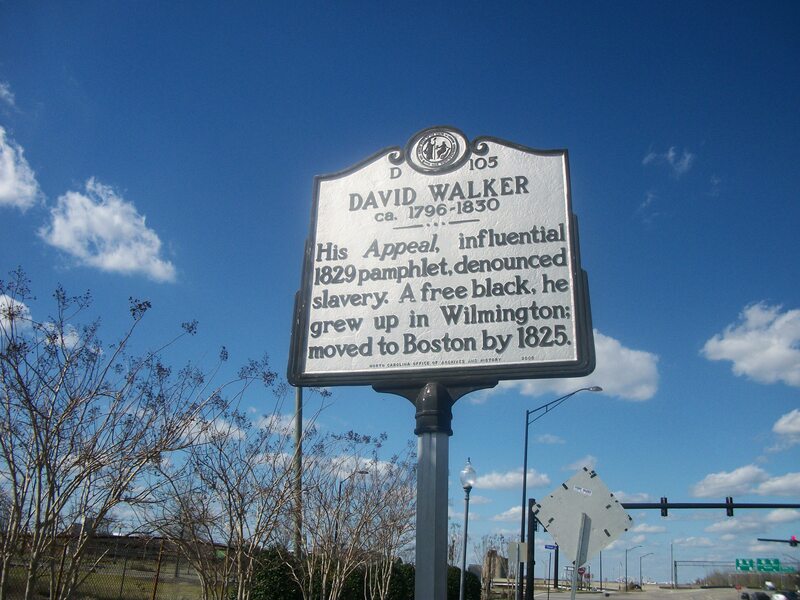 In his Appeal to the Coloured Citizens of the World, But in Particular, and Very Expressly, to Those in the United States of America, David Walker decried the savage, un-Christian treatment of blacks and directed his message directly toward the enslaved, finding “a primitive force in the black slave that, once aroused, will make him a magnificent fighter.” He took aim at the argument that blacks were a different species and not quite human, taking to task, among others, Thomas Jefferson for his claims in Notes on the State of Virginia. Details regarding David Walker’s early life are scant. A recent biographer, Peter P. Hinks, scoured local records. Indications are that he was born in 1796 or 1797 (not 1785 as earlier thought) to a slave father and free black mother. His birth, generally assumed to have taken place in Wilmington, may have been on the plantation of Revolutionary War Major General Robert Howe just across the Cape Fear River in Brunswick County. Young Walker inherited his free status from his mother and gained an education, most likely through the intercession of the Methodist Church. 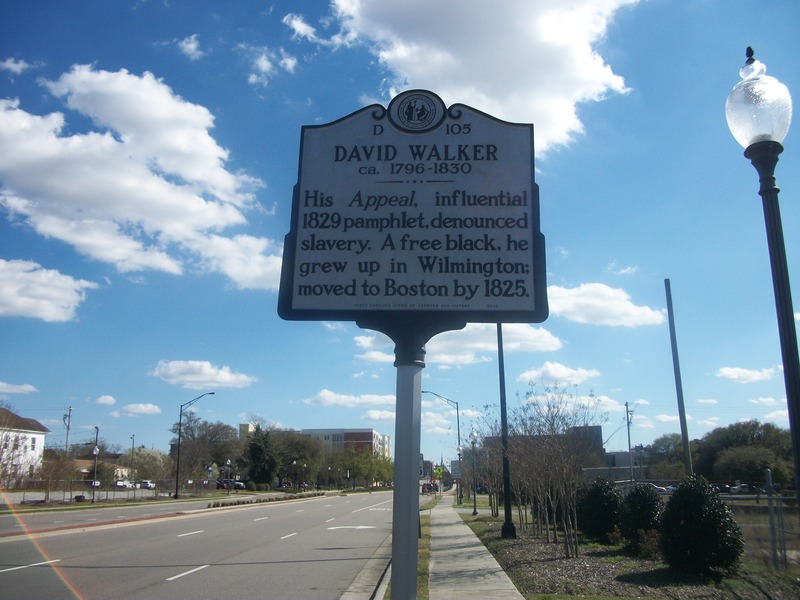 Between 1815 and 1820, Walker made his way to Charleston, South Carolina, and then traveled widely in the South. By 1825 he was living in Boston where he married the following year. On the waterfront he opened a secondhand clothes store and became local agent for the Freedom’s Journal, an abolitionist newspaper in New York City. Publication in 1829 of the 76-page Appeal, a pamphlet compared by some to Thomas Paine’s Common Sense, caused a furor. Walker employed creative means to see that it was circulated in the South, even sewing copies into the clothing of sailors. The reaction was swift. In North Carolina Governor John Owen in 1830 sent copies to the legislature and endorsed the passage of acts restricting the circulation of antislavery tracts, prohibiting teaching slaves to write, and requiring quarantine of blacks entering the state. Other states, including Virginia and Georgia, enacted similar legislation. The effect of Walker’s work has been overshadowed by Nat Turner’s rebellion of August 1831 but cannot be discounted. Scholars such as Herbert Aptheker, Vincent Harding, and Sterling Stuckey have judged Walker’s work to be of importance. His Appeal marked the transition from the gentle persuasion of Quakers to a more militant antislavery movement. Walker died under mysterious circumstances (but probably of consumption) in 1830.